Voices of Innovation -- the passion and discipline that make the miraculous an everyday experience. 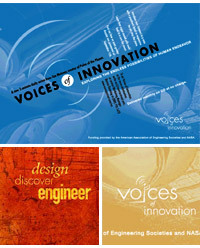 The 2-minute daily module on invention, Voices of Innovation, concluded new shows on January 2nd, 2004, due to difficulties in sustaining funding. Subscribing stations may continue to run programs on hand until December 31, 2004 by request of the distributor. On behalf of producer Jim Metzner and the funder, The American Association of Engineering Societies, we thank those stations that have aired Voices of Innovation, and encourage stations not already doing so to consider using Jim Metzner’s highly awarded Pulse of the Planet series in the Voices of Innovation slots. Find out how engineers helped avert a greater disaster on September 11, 2001, learn how secret codes and ciphers have changed our lives and hear a rare interview with Gemini astronaut Wally Schirra. Learn about: Mars Boot Camp, cell-sized surgeons, recycling oil wells, engineering snowboards, smart bandages, treating waste with biomimicry, space farms, robot therapists, and more! Voices host is Kacey Morabito of WHUD in Peekskill, NY. Produced by Jim Metzner, creator of Pulse of the Planet and Sounds of Science, regular contributor to NPR’s Weekend Edition /Saturday with Scott Simon, and winner of over a dozen broadcasting awards.